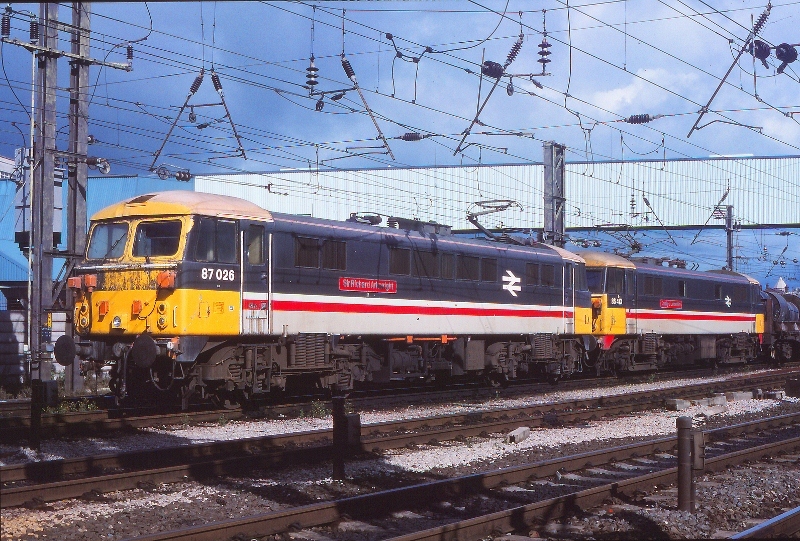 Martyn Hilbert's Railway Photography - AC Electrics - 87026 & 86413 at Preston. 87026 & 86413 at Preston. Class 87, 87026-'Sir Richard Arkwright' & 86413-'County of Lancashire', are at Preston standing on the through goods line awaiting a crew change, whilst working a train of steel coils from Ravenscraig to Dee Marsh on the 12th August 1988. The electrics will come off the train at Warrington. In the days when locos were 'common user', the locos are in InterCity livery but employed on freight duties.